At Zohar Law PLLC, we strive to give you access to as many visas as possible. From nonimmigration to immigration ones, we can help you through the application process to stay in the United States. We are New York City’s Top Rated Local® Legal Service and we have the experience to show it. By knowing the US immigration law proceedings and always staying up to date on even the most complex issues, our law firm can address an array of immigration issues that you and your loved ones may be going through. F-1 visas are for those who want to be full-time students in the United States. The F-1 visa or the Academic Student allows you to come to the United States as a full-time student who goes to an accredited college, seminary, university, conservatory, academic high school, elementary school, or some other academic institution or training program for languages. Basically, this visa allows you to come to the United States to pursue an education. It’s perfect for students who want to further their education at some of the top universities and schools in the world. To obtain this visa, you need to be enrolled in an academic program or have the chance to take a course of study that culminates in the chance to obtain a diploma, degree, or for a certificate. Additionally, the school you are going to attend must have the authorization of the United States government to accept students who are international. 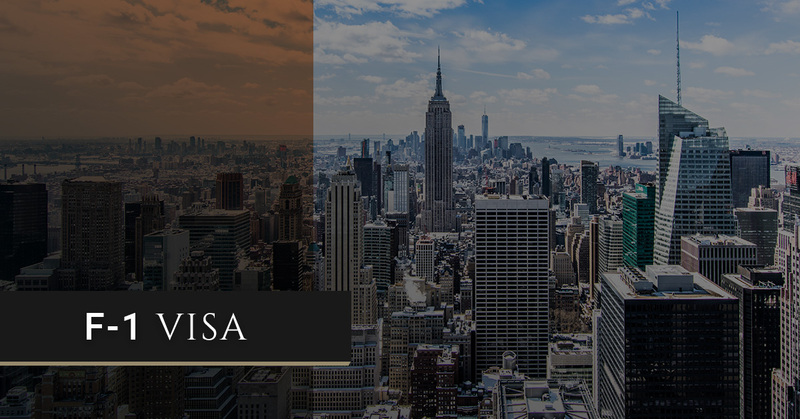 If you’re a student or you have a student that wants to learn in the United States full time, then apply for the F-1 visa with an immigration lawyer. Like with all visas, you need to have qualifications before you can apply for the F-1 visa. Below you’ll find the qualifications you need to follow to start the process of applying for this visa. Keep in mind that if you have any questions about this visa, you can always reach out to Zohar Law PLLC. Foreign residence: You need to have a foreign residence and when you are complete with your studies, you must intend to return there. Financial support: You need to demonstrate that you have sufficient support to help you prepare for your time in the United States. Ties to home country: You must show that you have strong ties to your country by showing that you have a job offer letter when you complete your studies, assets, family, or bank accounts. Sponsoring institution: You need to show that you are only studying at the sponsoring academic institution through the visa is granted. For instance, if you got a sponsorship at Columbia, then you need to solely study there. Keep in mind when you become a F-1 visa student, you’re unable to do some activities. For example, you cannot work off campus during the first academic year; however, you may be employed by on-campus employment as long as you follow certain conditions are restrictions. In addition, after the first academic year, you can engage in three types of off-campus employment that include: Curricular Practical Training, Optional Practical Training, and Science, Technology, Engineering, and Mathematics Optional Practical Training Extensions. You need an application fee, to fill out the Form DS-160, a valid passport, Form DS-157, and photos. In addition, you need to meet the admission requirements as well as apply for the F-1 visa. If you need more information about the application, then come visit Zohar Law PLLC.